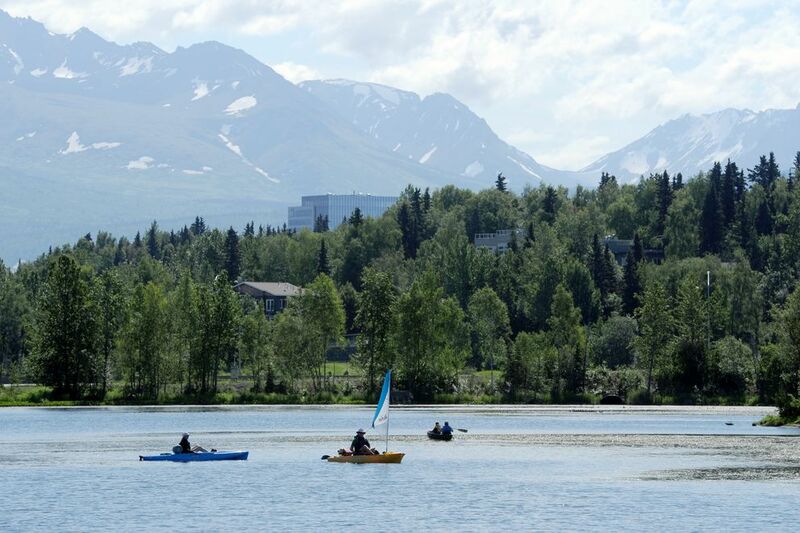 On your visit to Anchorage, take advantage of the city's incredibly connected and easy-to-navigate trail system to discover some of the town's most picturesque parks and breathtaking viewpoints. Anchorage boasts more than 120 miles of paved bike and multi-use trails, not to mention 130 miles of plowed winter walkways, 105 miles of maintained ski trails and 87 miles of non-paved hiking trails – and that's just within the municipality! As a bonus, many trails connect to the mountainous Chugach State Park, where you can wander high into the alpine tundra to access some 495,000 acres of jaw-dropping scenery. Within town limits, Anchorage's award-winning trail system threads alongside trickling creeks, winds along the stunning city coastline, ducks through pedestrian tunnels and traverses woodsy stands of trees. The crown jewel of the system is the Tony Knowles Coastal Trail, a recreational conduit that in warmer months teems with walkers, bicyclists, runners and more. The trail stretches nearly 11 miles from downtown's Second Avenue to Kincaid Park, traversing mostly level terrain. It's incredibly accessible, with multiple easy entry spots along the way. Westchester Lagoon is a perfect place to start your Coastal Trail jaunt. Just 1.6 miles from the trail's downtown beginning, the lagoon has plenty of parking. The park offers stunning views of the Chugach Mountains, flocks of waterfowl for the birders, glittering stretches of serene water, picnic tables and benches for contemplative breaks and a lively playground for the kids. From Westchester, you can travel 9 miles on the Coastal Trail to Kincaid Park, or instead head east on the 4-mile-long Chester Creek Trail, which ends at Goose Lake Park. Chester Creek Trail frequently runs alongside its namesake creek, and also passes by Valley of the Moon Park, a local favorite for its broad grassy lawns, picnic areas and a sprawling playground. Another popular stop along the Coastal Trail en route to Kincaid: Earthquake Park, on the west end of town near the airport. Famous for the long-gone houses that slid into the sea with the 1964 Good Friday Earthquake, the park today is a modest lot abutting the Coastal Trail, with a few interpretive signs and a photo-op view of downtown Anchorage back-dropped by the Chugach Range. On clear days, you may even see Denali lurking on the far northern horizon. If you want to try biking the trail system, multiple downtown vendors rent bikes all year round. Rates and lengths of rentals vary from hourly to by the day or even the week. Downtown Bicycle Rental (333 W. Fourth Ave.; 907-279-3334); Alaska Pablo's Bicycle Rentals (415 L St.; 277-2453); and Copper Whale Bike Rental (1101-1149 W. Fifth Ave.; 907-746-4644) are a few options to check out. Don't forget: when using Anchorage's trail system – whether scaling peaks or strolling alongside streams – it's important to remember some basic rules around safety and courtesy. The municipality reminds users that trails are usually multi-use and not intended for racing, so people should be aware of their surroundings, travel at safe speeds and never take up more than half the trail, leaving space for other users. Keep right, except to pass. Listen for others upon approach; it's common for bicyclists and others to warn those ahead with trilling bells or simple phrases like, "On your left!" Pets must be leashed and the law requires any animal or human litter be picked up and disposed of. Also, be aware of wildlife. 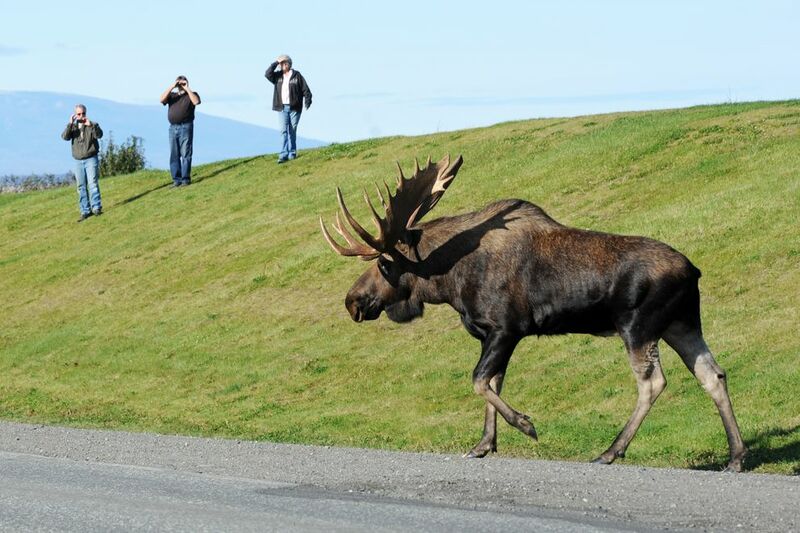 Moose, bears, coyotes and other animals share city trails, and that's especially true the farther one travels from downtown. Be alert and give wildlife plenty of room. When traveling in bear country, be mindful of making noise and staying observant.